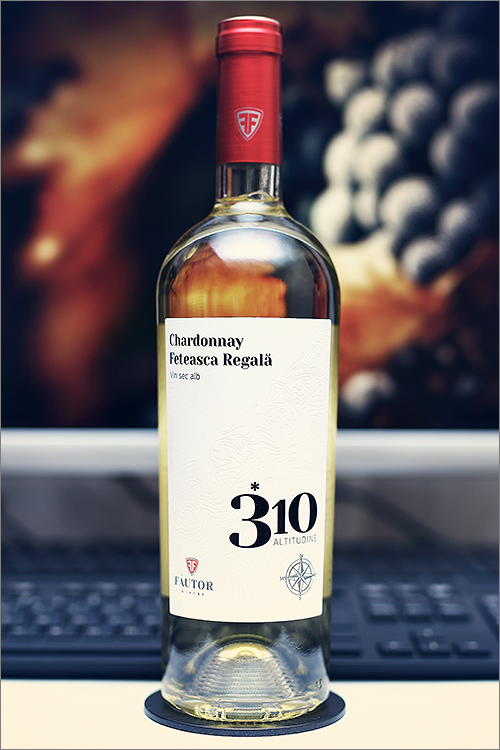 Today we are going to review a wine that is neither new nor old, yet it is still relatively unnoticed by the wine lovers – *310 Altitudine Chardonnay – Feteasca Regala 2016 from F’autor Winery. It is a white wine blend, made of 2 varieties: chardonnay, which is responsible for the wine’s body and structure, and feteasca regala, which adds flavour and complexity to the final blend. This wine is part of the *310 Altitudine wine series, that consists mainly of fresh and easy to drink wines, that can be enjoyed without too much fuss. That said, let’s get straight to the tasting! Pale straw-yellow color with white shades towards the rim of the glass. The nose is strong, filled mostly with sweet fruits flavours: ripe gooseberry, white apricot, white apple, white pear, lemon, pineapple, white grapefruit, mango, physalis, white mulberry, straw grass and some subtle notes of kumquat. The wine is dry, with high alcohol level, high acidity and smooth tannin. It tastes zesty, crisp and smooth, with a nuanced citrusy-mineral accent. This is fine wine with a quite fruity-tropical profile, as it feels elegant, complex and structured, with a fair overall balance and a rich, velvety and very appealing body. It has a medium-plus finish and a crisp, smooth and a bit bitter aftertaste. This is definitely a great Wine of Moldova and the overall rating says the same, with 90.6 points scored it is right there, among the best wines we’ve tasted so far. Please click on the chart icon on the left in order to get to the wine rating page, where you can find all the wines we’ve tasted to date. Conclusion: this is a very refreshing wine in its prime form, ready to drink now or in the next 9 to 12 months. Anyway our recommendation is to drink it now, as long as it is young and beautiful, as in our humble opinion it is better to drink wine a year to soon than a day too late. In order to amplify its aromatics, we would recommend to pair this wine with fresh oysters with just a splash of lemon juice or any white-sauce based dishes, like for example quattro formaggi pasta dressed up in white cheese sauce, as the creaminess in the dish will complement the wine’s smoothness and elegance. Enjoy!